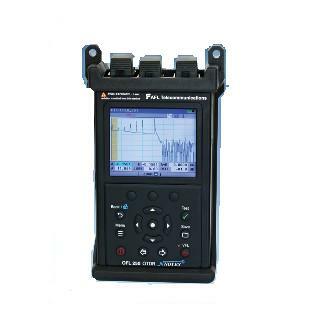 The Noyes OFL 250 from AFL Telecommunications is a single-mode OTDR with an integrated Optical Power Meter (OPM), Laser Source (OLS), and Visual Fault Locator (VFL) in a handheld package weighing only 0.8 kg (1.7 lb). With short dead zone and mid-range dynamic range performance, the OFL 250 is ideal for testing optical fibers in service provider metro areas and FTTx networks. The OFL 250 provides automatic and manual setup, precision event analysis, multiple-wavelength testing, a 12-hour battery life, internal data storage, and USB connectivity. OTDR and OPM test ports are equipped with tool-free adapters, which can be changed in seconds. Results are saved as industry standard .SOR files, which can be transferred to a PC for viewing, printing, and analyzing with the supplied Windows?compatible software.